Alpacas can improve lambing and kidding percentages by 15 – 30 %. Alpacas are easy to care for. They do not require special feed, crutching or lice control and they are not prone to fly strike or foot rot. Alpaca wethers pay for themselves very quickly. 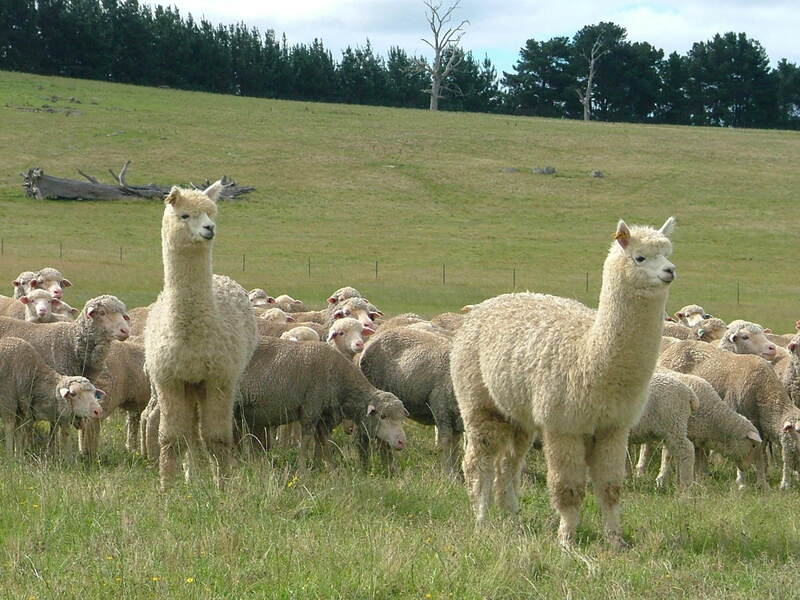 Usually one or two alpacas are needed per 40 hectares on flat open country and slightly more for hilly and heavily timbered country with up to 10 wethers per flock to control dingos or wild dogs. Please discuss your requirements with us as each farm has different needs depending on their flock management practices. During the last five years there has been an upsurge in interest in using alpacas to guard flocks of sheep and goats against loss of lambs and kids. This is possibly due to the build up in fox numbers and also due to the increased commercial value of lambs and kids. Q: How effective are alpacas at protecting lambs and kids from predators? We have been providing alpacas to farmers to protect their newborn lambs for more than 15 years with excellent results. Many of the early farmers used them to protect their valuable stud stock. After getting increases in lambing percentages of greater than 20% they are now finding that it is economical to use alpacas to guard their commercial stock as well. being alert and unnerving foxes by eyeballing them. Foxes will not eat fox baits in the neighbor’s paddock due to fear of alpacas in the next paddock. protection against dingoes and wild dogs. Sheep were seen hiding under alpacas to escape from a pack of town dogs. Q How many alpacas do you need per head of stock? The number of alpacas used to protect against foxes depends mainly on the size and the shape of the paddock rather than the size of the flock. 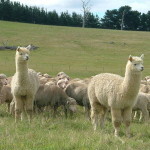 Alpacas will chase the foxes if they are seen or near the paddock. They also protect against crows and other avian predators. A rough guide of one alpaca per 100 ewes should be adequate. Against wild dogs and dingoes, the more alpacas the better i.e. 5-10 alpacas. If there is more than one alpaca in the paddock they may stay together and away from the flock but at night time they will camp with the flock. .
Q What type of alpaca is the best guard? Older mature animals of at least 15 months of age make the best guards. Males must be castrated as they are sexually active with ewes and does. Q Are they difficult to look after? No but they should be given the same inoculations and drenches as the stock they are running with. They don’t need to be crutched as they don’t get flyblown but it is best to shear them each year after the sheep are shorn. They provide light entertainment for the shearers in the cut out run. They don’t suffer from or carry footrot or sheep lice. However it is wise to dip them with the sheep. They are not susceptible to bloat and they are less susceptible to grain poisoning. Q What happens when a sheep dog is used to muster the sheep? Shy dogs may not work well initially but the alpacas will eventually ignore them if they are with the farmer and when they realise that they are not going to harm the sheep they are protecting. When lambing ewes are being moved it may be better to leave the sheep dog at home as alpacas will lead sheep through gates and into the yards without the help of dogs. This makes it much easier to move protective ewes. When a gate is opened alpacas will lead the flock into the next paddock. If grain is used as a reward then they will come running and lead the flock towards you. Q How long does it take for alpacas to bond with the flock? It is best to give the alpacas a couple of weeks to get to know the paddock and bond with the flock. However, we know of several farmers who, after suffering severe losses from foxes, have introduced alpacas to the flock after lambing and kidding has begun, with spectacular results. Ie no more losses. So it is never too late to introduce them to the breeding flock. Q Do alpacas actually kill foxes? Not normally but they can if necessary by stomping on them and then crushing them under their necks with great force. Alpacas protect their territory and stare at foxes and then chase them out of the paddock. Foxes and most other predators don’t like being watched and nobody likes being spat at. Q Are alpacas effective at protecting sheep against dingoes and wild dogs? Reports from the Darling Downs in Queensland and Victoria indicate that packs of dingoes and wild dogs have been deterred from attacking sheep when a flock of alpacas are guarding them. Q What diseases do alpacas carry? Alpacas do not carry sheep or cattle lice, foot-rot or get fly struck. They normally do not carry many worms due to their good toilet habits but if they are run with sheep and goats they will pick up some worms and therefore require a similar drench regime as their companions. They are however susceptible to liver fluke. Q Do they transmit Johne’s Disease? Alpacas are susceptible to bovine (cattle) Johne’s disease. As at June 2002 there have been no known JD infected herds in Australia. They do not contract ovine (sheep) JD, which is caused by a different strain of M para tuberculosis. Q Is there a risk of fibre cross contamination? There is very little risk, as alpacas do not shed their fleeces. Alpacas do not come into physical contact with sheep unless forced to in yards and even then the risk is less than from dogs during yard work. However to minimize the risk alpacas should only be run with sheep during the lambing season and they can be removed a couple of days after the last lamb is born and at least 8 weeks before shearing. Most farmers do not shear their ewes with young lambs at foot to prevent mismothering. When not needed as guardians they should be kept in a group of at least two in a paddock near the homestead where they get accustomed to farm dogs and keep the foxes away from the chook yard. With occasional feeding they will feed out of your hand and be easy to handle. Q How long do they live? In South America they live til about 20-25 years. So in Australia we should be able to expect at least 15 years of active service as guardians. Their teeth continue to grow to replace wear. Q How are they shorn? This is best done annually after the sheep are shorn to avoid any risk of fibre contamination. They can be restrained easily on their side by leaning on their neck with another person holding the rear legs in a similar way that calves used to be branded. If many are being shorn it may be easier to use ropes with slipknots positioned just above the pasterns near each foot. The alpaca can then be stretched preferably with each pair of legs separated by a 45cm (10cm by 5cm thick) board. They can be shorn with conventional shearing equipment but a variable speed hand piece with a flexible cord is more convenient for shearing large numbers.